The late morning glare was bright on and above the Haw River and the light was frustrating me and my camera. Then movement coalesced out of the glare and two bald eagles appeared. A mature bald eagle was chasing the other eagle, a 4-year-old. Between the glare and fast action, I didn’t realize the 4-year-old eagle was carrying a fish until I glanced down at my camera’s screen. The adult bald eagle had been chasing the younger bird, hoping to steal its meal. 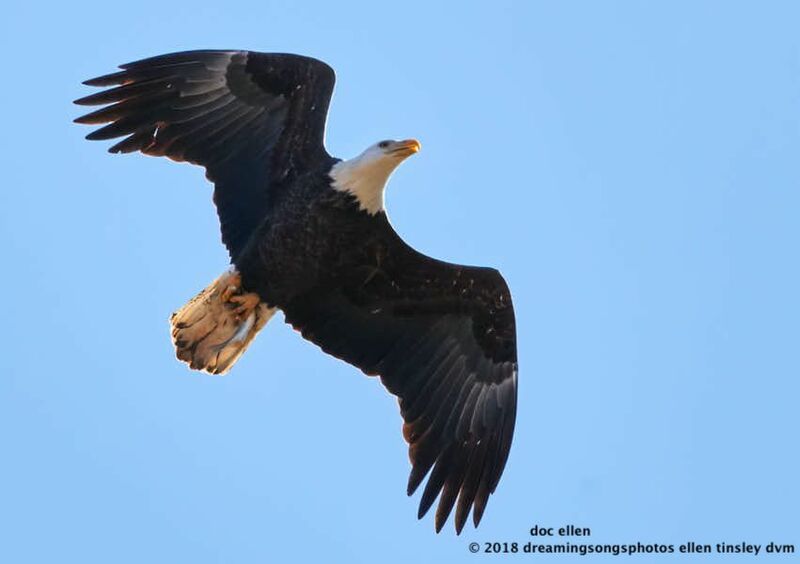 Posted in birds, Eagles of Jordan Lake, Haw River, Jordan Lake, Jordan Lake State Park, photography, raptors, wild birds and tagged as American bald eagle, bald eagle, bald eagle flight, bald eagles of Jordan Lake, eagle, eagles of Jordan Lake, flight, immature bald eagle, immature eagle, Jordan Lake, Jordan Lake State Park, raptor.